The Pediatrics Residency at the University of Iowa is a three-year, ACGME-accredited program that offers exposure to an array of patients and learning situations. Residents have access to high-powered faculty members, comprehensive experience in all subspecialties and a state-of-the-art clinical facility that was ranked nationally in eight Pediatric specialties. The new University of Iowa Stead Family Children’s Hospital that opened in early 2017 will build upon that tradition. 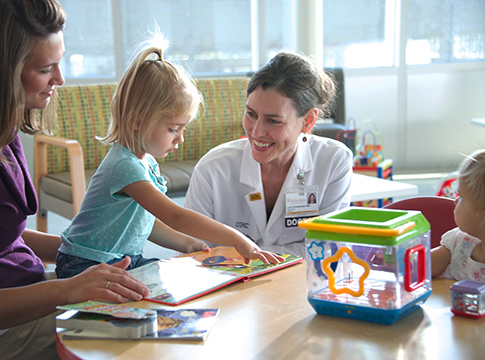 UI Stead Family Children’s Hospital is Iowa’s only comprehensive children’s hospital and academic medical center. I chose Iowa because I was seeking a program that would allow me to cultivate my skills and personal development by providing a balance between autonomy and support. In addition, the faculty and residents made me feel comfortable and created an environment that made me excited to get to work here every day. While attending the University of Iowa for medical school, I was exposed to all of the wonderful faculty and staff that the Children’s Hospital has to offer. I was confident that the University of Iowa Stead Family Children’s Hospital is a place where I can grow professionally and make lasting friendships. I wanted to stay in the Midwest and train at a program with a history of strong job and fellowship placement. The exceptional family-friendliness and camaraderie of current residents made Iowa an easy choice. I chose Iowa because the staff and other residents provided a supportive and fun environment to practice pediatrics! The University of Iowa Stead Family Children’s Hospital has a reputation for excellent pediatric care, and I am very excited to be a part of its care team. I chose Iowa because of the extraordinary quality of the faculty and residents who were part of the program. Iowa also offers the opportunity to pursue any career and/or fellowship in the field of pediatrics. Go Hawks! I chose the University of Iowa because it offers outstanding clinical training in a friendly environment, great faculty support, excellent teaching and high quality research, and is located in an amazing city in which to live and raise a family.